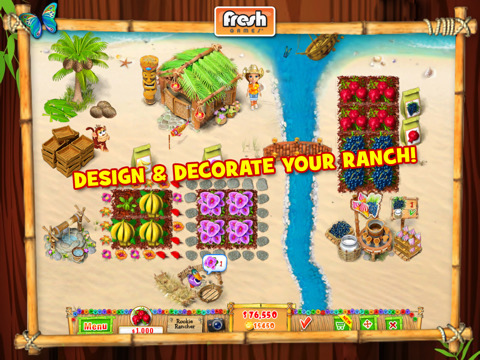 Fresh Games has whipped up an impressive sequel with Ranch Rush 2 for the iPad. Aimed squarely at folks who spend hours tending to their crops in Farmville, Ranch Rush 2 takes the protagonist, Sara, out of the standard rural farm and plops her onto a tropical island. This time, instead of growing crops like corn and potatoes, you’ll be harvesting bananas, wildflowers, coconuts, and other tropical delights. Like most games of its ilk, Ranch Rush 2 takes you through the paces slowly and methodically in order to make sure you fully understand the ins and outs of designing a successful and efficient farming operation. You’ll start by laying down small patches of soil, planting seeds, harvesting your crops, and delivering them to the market. After a few rounds, you’ll begin to expand your operation by increasing the size of your garden, taking orders from special customers, and even enlisting the help of a little monkey to gather coconuts. And because that monkey doesn’t work for free, bananas quickly become one of your most important crops. The developers have added a number of nice, if commonplace, features to the game to keep your interest. First are the minigames. Every week, Sara will need a little break from the stresses of farm life. One of those diversions is fishing for progressively larger fish. 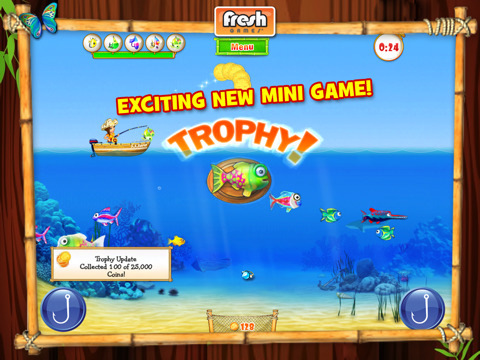 Move Sara’s boat back and forth on the surface and cast her hook just in time to catch the fish. As mentioned, the fish get larger and larger so Sara will need to keep at it in order to upgrade her lures if she wants to bag the big ones. 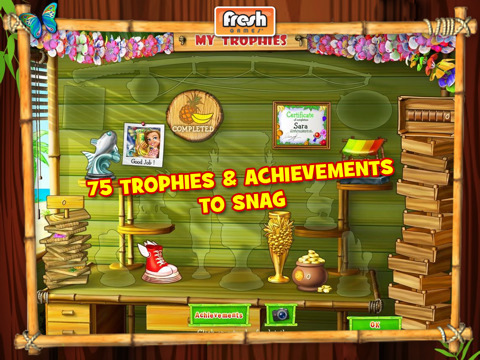 Additionally, achievements and trophies have been added for meeting various criteria. Again, these features are almost a given in most games these days, but the goals included in Ranch Rush 2 are very well crafted and add some nice incentive to keep players motivated. Ranch Rush 2 does a nice job of keeping controls simple, though as things get more complicated and the orders build up and become more difficult to fill before the timer runs out, players may find themselves struggling to find the right icon or remember what action they need to use for their current objective. Fortunately, the game allows you to play a few moves ahead. For example, you can plant your seeds, grab your crates, and harvest your crop all without waiting for Sara to perform each action. And, if you get ahead of yourself and use the wrong action, there’s a “clear” option, allowing you to go back and get it right. Bottom Line: Perfect for the OCD crowd, Ranch Rush 2 will keep you coming back to organize your crops, find new seeds to plant, and build your farming empire. The cartoon aesthetic is fun and welcoming and for under five bucks it’s a heck of a value. 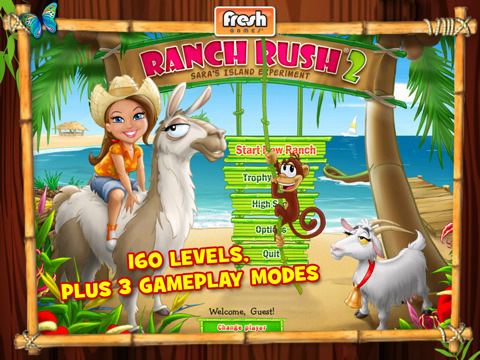 Ranch Rush 2 is compatible with iPad and requires iOS 3.2 or later.